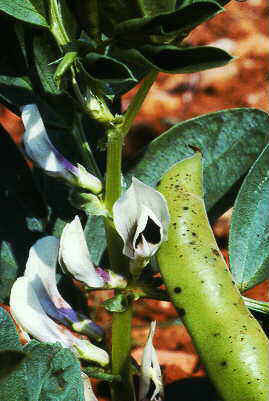 Photo of Vicia fava L.
Herbaceous annual plant of the pea family -papilionaceae– up to 80 cm. tall. Quadrangular, robust stems. Compound leaves, till 3 ovate leaflets and with toothed stipules at the base. Very conspicuous flowers, till 2 cm, white with the wings smeared in black. The fruit is a pod, reaching 25 cm, pubescent. Seeds till 3 cm. Native from Asia, but naturalised and cultivated as food.